Both lightweight and shock resistant, Richard Mille Rafael Nadal timepieces are some of the most exquisite Swiss sports watches on the market. Skeletonized movements and modern case materials are characteristic of these masterpieces. Have you ever wondered which watches tennis stars wear during the big championships? Roger Federer, one of the most successful tennis players of all time, is a well-known Rolex fan and brand ambassador. He even owns a vintage Cosmograph Daytona chronograph from 1981, which he received as a gift from his wife for his 30th birthday. When Spaniard Rafael Nadal steps onto the tennis court, all eyes turn to his wrist. There, you can find watches from Richard Mille. The Swiss manufacturer is based in Les Breuleux and was founded in 1999. 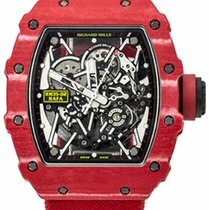 Richard Mille wristwatches are some of the finest and eccentric Swiss timepieces available. The highlights of the brand are their Rafael Nadal models, which they created in honor of the tennis player. The Nadal watches are defined by their exceptional light weight, shock resistance, and unusual materials and designs. Rafa, as he's often called, wears Richard Mille watches both on and off the court. For example, in January 2017, at the Australian Open, he made it to the finale with an RM 27-02 on his wrist, although he lost to Roger Federer after a five-set battle. Today, the timepiece he wore is worth around 850,000 euros. A Richard Mille watch was even stolen from Rafael Nadal. In June 2012, after defeating Novak Djokovic at the French Open, his 300,000 euro watch mysteriously disappeared from his hotel room. This was likely quite a shock for Nadal, as the watch was only on loan. Luckily, the police recovered the watch quickly and arrested the thief. How much does a Richard Mille Rafael Nadal watch cost? Richard Mille Rafael Nadal watches are some of the most exquisite and expensive timepieces available. It's difficult to find a new RM Rafael Nadal watch for less than 100,000 euros. The prices are so exorbitant due to the timepieces' time-consuming production. Constructing the case alone takes a long time due to its complexity. The cases are usually domed, in tonneau form, and made of modern materials such as carbon fibers or magnesium alloys. Thanks to these materials, Richard Mille has reduced the weight of their watches to record-breaking new lows. This manufacturer also offers ornately skeletonized movements and tourbillon watches. In 2010, Richard Mille introduced their first Nadal watch, the RM 027. The manufacturer wanted to produce a shock-resistant tourbillon watch that could withstand the stress and rapid movement of a tennis match. The RM 027 model is limited to a run of 50 pieces and is one of the most lightweight mechanical watches out there with a tourbillon. The skeletonized movement weighs less than 4 g. Richard Mille achieved this weight by using titanium and the LITAL® alloy for the caliber. The alloy also makes the caliber more shock resistant. The carbon case measures in at roughly 40 mm x 48 mm. Altogether, the case and movement weigh 13 g. A synthetic strap keeps the watch on your wrist. 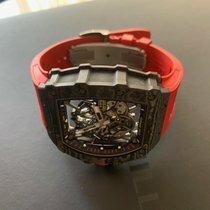 Since the Richard Mille RM 027 Tourbillon Rafael Nadal is a limited edition with very few pieces available on the market, you should set aside around 500,000 euros for a well-maintained model. 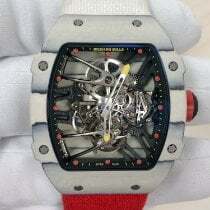 Three years after the RM 027, Richard Mille introduced the RM 27-01. This timepiece is unique because of its novel shock protection system. The manufacturer uses 0.35 mm-thin steel cables to secure the caliber in place. Due to this extraordinary mechanism, the timepiece can withstand accelerations up to 5,000 G. The anthracite polymer case measures in at about 46 mm x 39 mm and is injected with carbon nanotubes. Like the caliber in the RM 027, the tourbillon caliber is made of titanium and the LITAL® alloy. The LITAL® alloy is primarily used in the fields of aviation and astronautics. This Richard Mille Rafael Nadal watch is limited to a run of 50 pieces. When the RM 27-01 was introduced to the market in 2013, the watch cost over 600,000 euros. The term quartz watch takes on a whole new meaning with the RM 27-02. Normally, when you hear the phrase "quartz watch," you think of a timepiece with an inexpensive, battery-powered movement. However, the RM 27-02 isn't powered by a quartz movement, but rather a skeletonized manual tourbillon movement. The watch's case is made of quartz as well as carbon. This mix of materials is especially lightweight and at the same time, very tough. Hundreds of wafer-thin layers of this quartz material make up the case, creating a grain. Richard Mille uses the layered quartz for both the front and back side of the case. The middle section of the case is made of numerous carbon layers. Just as groundbreaking is their use of the case back as the movement's back plate. The watch's case measures in at 40 mm x 48 mm and is kept on your wrist by an eye-catching orange fabric strap. The RM 27-02 is limited to a run of 50 pieces and costs around 600,000 euros. The Richard Mille Rafael Nadal RM 035 is one of the most affordable Nadal watches. Pre-owned, the watch costs around 80,000 euros. New, the watch costs around 105,000 euros. The intricately skeletonized caliber only weighs 4.3 g and is set in a magnesium/aluminum case. The case is very lightweight, corrosion resistant, and hard. The RM 035 doesn't feature a tourbillon, but it is a Chronofiable-certified wristwatch. In order to receive this Swiss quality mark, a watch must undergo a simulated accelerated aging process. This tests how the watch is affected by jolts, acceleration, moisture, magnetic fields, and temperature changes. The process lasts three weeks and simulates a period of six months. 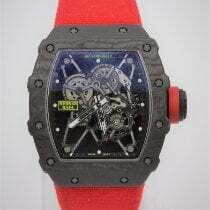 The highlight of the Richard Mille Rafael Nadal RM 35-01 is its case. It's made of NTPT Carbon, which is comprised of layered carbon fiber. At most, each layer is 30 micrometers thick, making it remarkably thin. The finished watch case measures approximately 50 mm x 42 mm. It has a characteristic grain. NTPT Carbon is especially hard. This Nadal watch is about 14 mm thick and waterproof to 50 m. The manual caliber RMUL3 powers this timepiece. Like the RM 035, the movement is skeletonized. It has a double barrel and 55-hour power reserve. Pre-owned RM 35-01 watches are available in very good condition for around 100,000 euros; prices for a new watch start around 105,000 euros. The RM 35-02 is the first Nadal watch with an automatic caliber. The caliber RMAL1 winds the movement automatically while its being worn on your wrist. Before this watch was introduced, all Nadal watches had to be regularly wound by hand. The RMAL1's winding rotor is very efficient and its inertia changes based on how it's being moved. If you're not moving your arm very much, the winding rotor moves faster. If you're playing tennis, the rotor slows down and winds the watch more effectively. The power reserve lasts 55 hours, and like the RM 35-01 movement, the caliber in the RM 35-02 is skeletonized. The case of the RM 35-02 is available in two variants: NTPT Carbon or Quartz-TPT Red. Both cases are made of composite materials: The NTPT version is made of razor-thin carbon fiber layers and the Quartz-TPT version is made of quartz layers as well as synthetic resin. Both versions have a grain. The timepiece's red case with dashes of white catches the eye, and a yellow strap keeps the watch on your wrist. If you're interested in purchasing an RM 35-02, you should be prepared to spend at least 120,000 euros.